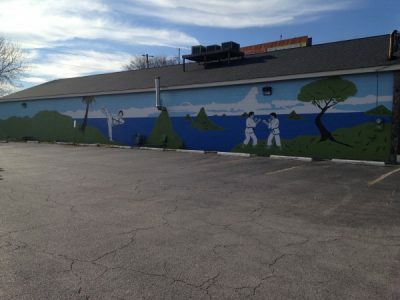 Harkening back to the days of painted advertisements, the Lemongrass Thai Bistro in downtown Macon will catch the patron's eye with their vibrant mural. 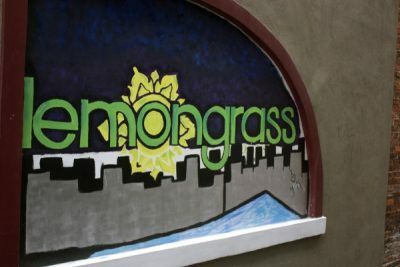 Painted onto the side of the historic building that houses the restaurant, the murals artists Denny Hanson and Dylan York convey the chic, modern atmosphere of Lemongrass. It is a depiction of Middle Georgia history. The panels move chronologically from left to right. 1993 condition: excellent. 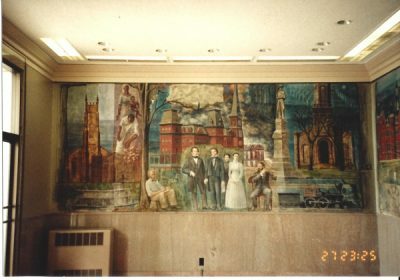 As of January 2014 the mural is no longer allowed for public viewing. Macon Arts Alliance Announces New Downtown Mural Installations By creating a series of beautiful art installations through a communal process, Macon Arts Alliance and the Macon Transit Authority can now literally and emotionally transport passengers, visitors and residents to beautiful places. 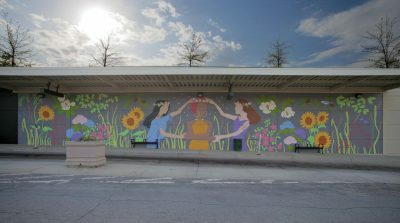 The new larger-than-life mural installations at the downtown Macon Transfer Station use viewers’ imaginations to connect them to nature and to new possibilities through transit, flight and collaboration. 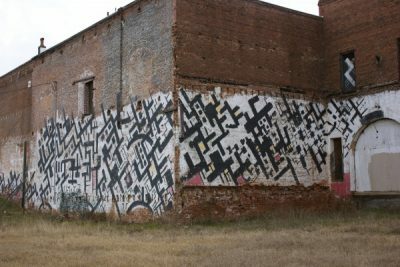 Macon Arts Alliance and local resident, Marlon Baldwin, partnered to secure a generous grant from the Downtown Challenge of the Community Foundation of Central Georgia to install three murals on the expansive wall located on the MTA Transfer next to the historic Terminal Station on 5th Street in downtown Macon. 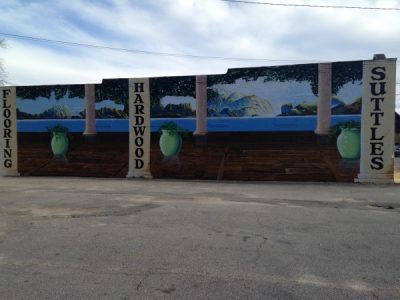 Interested residents and visitors were encouraged to participate in the mural creations by working directly with Isaac Ramsey, Christopher Logan and Mary Frances Burt, the featured artists who were selected through a blind judging process. The new vibrant art installations add vitality and interest to the bustling station where MTA passengers can make transit and personal connections. The public and press were invited to join Macon Arts Alliance for an official ribbon cutting ceremony of the recently completely project on Friday morning. 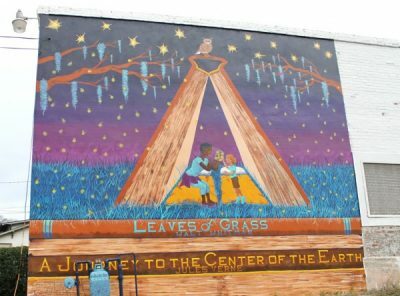 About the Muralists: Mary Frances Burt BFA, Macon, GA Mary Frances earned a BFA from the Lamar Dodd School of Art, University of Georgia. A professional artist and designer, she is the Creative Director and Co-Owner of Burt and Burt Graphic Design and lives here in Macon. 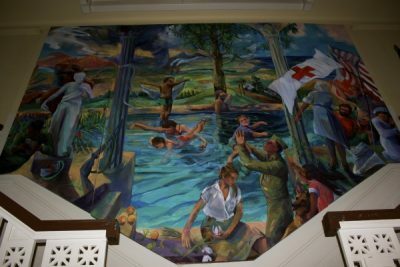 Mary Frances’ mural is titled “A Celebration of Grace” and the work was created to convey a message of goodwill. 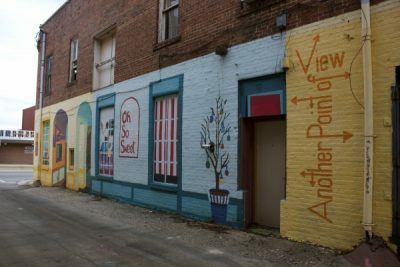 Using a color-coded system, Burt had community members participate in painting the mural along with her, offering them an opportunity to add their personal signatures to the piece. Isaac Ramsey MFA, Macon, GA. Isaac Ramsey earned an MFA from the University of Connecticut in Scenic Design. He is a Professor of Scene Design at Georgia College & State University. Ramsey has national experience in scene design and production and is a Kennedy Center award winner in Scene Design for Oedipus Rex. Isaac’s mural focuses on interaction with the natural world, specifically the State of Georgia’s birds of prey and their symbolism in our mascots such as the Hawks and Falcons. 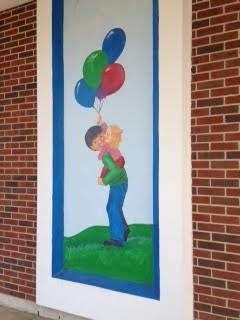 Isaac had st assist him students and residents collaborate in the installation of his mural. Christopher Logan MFA, Macon, GA. Christopher Logan (Loganic) has an MFA from NYU. 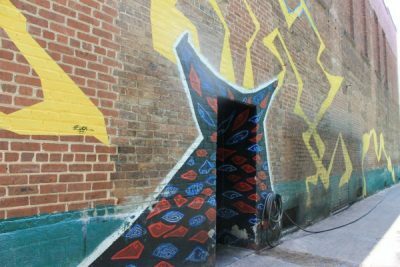 Logan is an artist with an international exhibition and mural production history including mural commissions in Michigan USA, Berlin, Germany and Dakar, Senegal. Loganic’s mural incorporates silhouettes of individuals he encountered at the MTA station. Bus passengers volunteered to have their shadows sketched and were later included in the finished mural. About Macon Arts Alliance The mission of the Macon Arts Alliance is to foster and support the advancement of arts and culture in Central Georgia. We strive to be an innovative leader of a diverse and thriving arts community as well as a strategic partner in creating an open, inclusive, and vibrant place for artists, arts organizations, residents, businesses, and tourists. Macon Arts Alliance is the designated local arts agency of Macon-Bibb County.For more information about the Macon Arts Alliance, please visit www.maconartsalliance.org or call 478-743-6940. The Macon Arts Alliance is located in Historic Downtown Macon at 486 1st Street, Macon, Georgia 31201. The mural depicts a large ceranda with tiles. The name "Suttle's" is written down one of the columns for advertising. It can be seen coming towards downtown on Vineville Ave. (July 1993 condition: "Great- Not yet finished") 2014 condition: Good. Minor abrasions and flaking here and there, but a nice piece. Paint appears to be younger than 20 years.